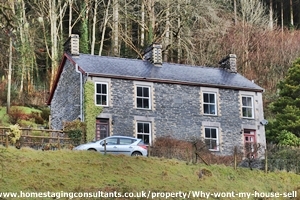 Property > Why won't my house Sell? According to government statistics, there are around 100,000 property sales every month in the UK. Yet, some homes sit on the market month after month without attracting a buyer. If you are a homeowner with a property that just will not shift, it can be both frustrating and confusing. You may feel your property competes well with the other properties currently available in your area, and yet a sale still seems illusive. There are several reasons why you may be struggling to sell your property. Here are just a few of them, along with some suggestions for how best to address the situation. 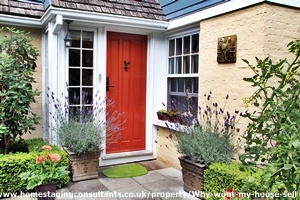 Your property may be very well presented internally, and perfectly proportioned, but if it is not attractive from the outside, you will struggle to get viewers through the door. When potential buyers are looking for their new home, it is likely that they will be looking for a 'wow' factor, and that is difficult to achieve with an unattractive property exterior. There are several things you can try in order to remedy this struggle. Depending on the extent of the problem, and the details of your particular challenge, external rendering, a well-manicured garden with attractive foliage, and a re-planned entrance are all steps that could help to get viewers over the threshold. More unusual properties, or those in a very rural location, may take longer to sell, but the important thing here is to find an agent who understands the market well and knows how to find your perfect buyer. Do your research and find an agent that has experience of selling other unusual property or specialises in rural property. That specialist agent may not necessarily be your most local agent, but prospective buyers often have a wider geographical search area when looking for a property with quirky character or countryside views, so it's worth choosing an agent who understands this and will market your property more widely. A restrictive covenant is a legal obligation for the owner of a property to either take a certain action or refrain from a certain action. This can put some prospective buyers off, but the key here is to make it all as straightforward for the new buyer as possible. All of the specifics of the restrictive covenant will be detailed in an extensive legal document, but it will help remove concern for potential buyers if you are able to provide them with a synopsis of the main points. The last thing you want is for a restrictive covenant to be a shock to the potential new buyers, so it is important to be up front about it as early on as possible. Although leasehold properties are very common, it is still an issue that will put off some potential buyers, especially if the number of years left on the lease has fallen below 100. If you think a leasehold issue may be what is holding up your house sale, you can look into either extending the lease, or potentially buying the freehold for the property. Whilst not a cheap option, for an otherwise desirable property, you could well make you money back in the sale of the property. Seek professional advice from a solicitor and an estate agent on the cost of these options and the impact it could have on the value and saleability of your property. A few years ago, there were plenty of buy-to-let landlords and would-be property developers waiting to snap up properties that needed work doing, but with rising costs for commercial landlords and more challenging lending criteria, fewer buyers are likely to have cash readily available to take on a project property. 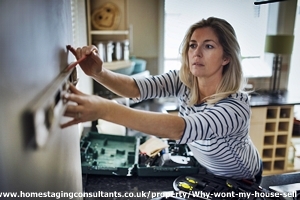 If you have time and money to spare, it may well be worth you addressing the work requirements before trying to sell the property, but ensure you seek advice from professional tradesmen and estate agents about the cost of the work and how it will impact the value of your property. 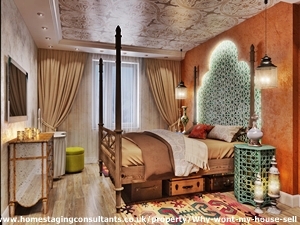 Strong colours, personal clutter and the way you use the rooms of your house can all lead to a property feeling too personalised. If prospective buyers are overwhelmed by your personality and the way you live in your home, they will struggle to picture themselves in the property. When it comes to selling a property, you want to appeal to the widest audience you can. Viewing your property objectively is never an easy task, so it is advisable to ask for help with this, either from a friend or from a professional. A professional Home Stager can advise on all areas of improving property, has access to trusted tradespeople and can even advise on options to style without needing to redecorate. All Home Staging will aim to increase the visual appeal of your property, enhance its best features and increase the feeling of space. People buy homes, not property. They buy with their heart and want to feel that they could make it a home for themselves. If you are still struggling to find a buyer for your property and you are keen to achieve a quick house sale, you may wish to consider selling your property to a cash home buyer. Cash home buyers will buy your property at a discount, so it will not be the right option for everyone, but they are often able to complete the sale in as little as a week, and provide a guaranteed sale, so are a great option if you are looking for speed and certainty.